Theoretical physicist Boris Yakobson and his Rice colleagues are among many looking for a way to speed up ORR for fuel cells, which were discovered in the 19th century but not widely used until the latter part of the 20th. They have since powered transportation modes ranging from cars and buses to spacecraft. The Rice researchers, including lead author and former postdoctoral associate Xiaolong Zou and graduate student Luqing Wang, used computer simulations to discover why graphene nanoribbons and carbon nanotubes modified with nitrogen and/or boron, long studied as a substitute for expensive platinum, are so sluggish and how they can be improved. Doping, or chemically modifying, conductive nanotubes or nanoribbons changes their chemical bonding characteristics. They can then be used as cathodes in proton-exchange membrane fuel cells. In a simple fuel cell, anodes draw in hydrogen fuel and separate it into protons and electrons. While the negative electrons flow out as usable current, the positive protons are drawn to the cathode, where they recombine with returning electrons and oxygen to produce water. 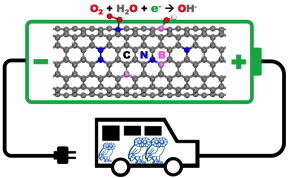 The models showed that thinner carbon nanotubes with a relatively high concentration of nitrogen would perform best, as oxygen atoms readily bond to the carbon atom nearest the nitrogen. Nanotubes have an advantage over nanoribbons because of their curvature, which distorts chemical bonds around their circumference and leads to easier binding, the researchers found. They also showed co-doping graphene nanoribbons with nitrogen and boron enhances the oxygen-absorbing abilities of ribbons with zigzag edges. In this case, oxygen finds a double-bonding opportunity. First, they attach directly to positively charged boron-doped sites. Second, they're drawn by carbon atoms with high spin charge, which interacts with the oxygen atoms' spin-polarized electron orbitals. While the spin effect enhances adsorption, the binding energy remains weak, also achieving a balance that allows for good catalytic performance. The researchers showed the same catalytic principles held true, but to lesser effect, for nanoribbons with armchair edges. "While doped nanotubes show good promise, the best performance can probably be achieved at the nanoribbon zigzag edges where nitrogen substitution can expose the so-called pyridinic nitrogen, which has known catalytic activity," Yakobson said. "If arranged in a foam-like configuration, such material can approach the efficiency of platinum," Wang said. "If price is a consideration, it would certainly be competitive." Zou is now an assistant professor at Tsinghua-Berkeley Shenzhen Institute in Shenzhen City, China. Yakobson is the Karl F. Hasselmann Professor of Materials Science and NanoEngineering and a professor of chemistry. The research was supported by the Robert Welch Foundation, the Army Research Office, the Development and Reform Commission of Shenzhen Municipality, the Youth 1000-Talent Program of China and Tsinghua-Berkeley Shenzhen Institute. Located on a 300-acre forested campus in Houston, Rice University is consistently ranked among the nation’s top 20 universities by U.S. News & World Report. Rice has highly respected schools of Architecture, Business, Continuing Studies, Engineering, Humanities, Music, Natural Sciences and Social Sciences and is home to the Baker Institute for Public Policy. With 3,879 undergraduates and 2,861 graduate students, Rice’s undergraduate student-to-faculty ratio is 6-to-1. Its residential college system builds close-knit communities and lifelong friendships, just one reason why Rice is ranked No. 1 for quality of life and for lots of race/class interaction and No. 2 for happiest students by the Princeton Review. Rice is also rated as a best value among private universities by Kiplinger’s Personal Finance. To read “What they’re saying about Rice,” go to http://tinyurl.com/RiceUniversityoverview .